The malls are decked with holly, your inbox is filling up with holiday-themed promotions, and you've deemed it socially acceptable to start listening to your favorite holiday playlist on Spotify ... or maybe that's just me. Either way, the holiday season is here, and marketers are gearing up to finish off the year strong. But just like shopping for gifts, planning your holiday campaign is something you don't want to shove off until the last minute. There's going to be a lot of spending going in over the next month or so, which is why it's important to have a plan for reaching your customers and prospects before your competitors do. Haven't started planning your campaign yet? Don't panic. We've mapped out a comprehensive guide with everything you need to launch a holiday marketing campaign this season. From offer templates to free holiday-themed stock photos, we've peppered this step-by-step guide with resources designed to get your campaign up and running right away. 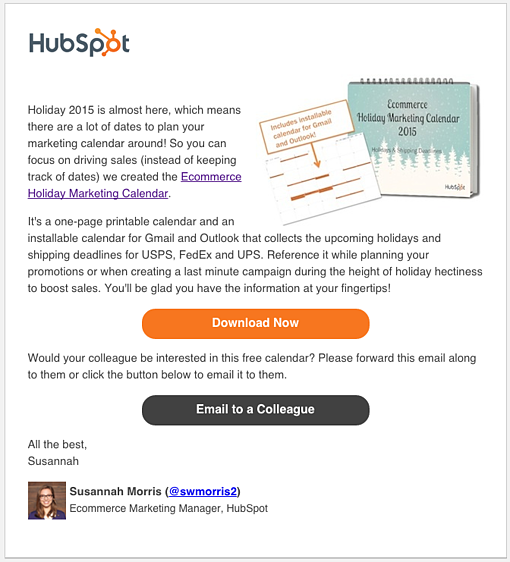 Download more holiday marketing resources to help your business succeed this season from HubSpot's #HolidayHub. While creating content has become ingrained in the day-to-day lives of most inbound marketers, launching a campaign is a little different. Unlike a tweet or an infographic, campaigns require you to align all of your marketing channels around one specific goal or message. Holiday campaigns -- like all campaigns -- typically run for a concentrated period of time. Depending on your industry, they can start as early as October and often spill over into January. Now that you know what you're in for, let's not waste any more time. Below we'll kick off this process by walking you through establishing your campaign and offer. Decide on your campaign goals and audience. Before you start creating an offer, you need to determine what it is that you're looking to achieve. What is the ideal outcome of this campaign? Generate 1,000 leads who are interested in our annual holiday sale by December 5, 2015. Generate 5,000 sign-ups for our holiday shopping app by November 30, 2015. Collect $50,000 in donations for charity XYZ by December 20, 2015. To help you better align your marketing efforts with SMART goals, check out this free goal setting template. You can use this template to summarize your goals, calculate your greatest marketing need, and set deadlines. With goals in place, the next step is to define your target audience. The more information you can gather about the people you're trying to reach, the better. Where are they hanging out on social media? Do they prefer to consume information on their desktop or mobile? This will help you make smarter marketing decisions when it comes time to create content and plan promotions. If you already have a few buyer personas in place for your marketing efforts, you'll want to start by narrowing your focus. Does your campaign pertain to all segments of your audience? If not, you'll need to immediately weed out the folks who you don't want to include. If you don't already have buyer personas or would like to create campaign-specific personas, we recommend you check out our free buyer persona templates. These templates will make it easy for you to build out and organize your persona data. The offer that you create will serve as the center point for all of your campaign initiatives. Typically offers take shape in the form of ebooks, whitepapers, templates, online courses, videos, tools, etc. While there are a lot of options to choose from, we advise you to run with an approach that makes the most sense for your intended audience. Think about it: If you know the people you're trying to reach are typically strapped for time -- particularly during the holidays -- you might want to create a set of easy-to-use templates instead of a lengthy ebook, right? 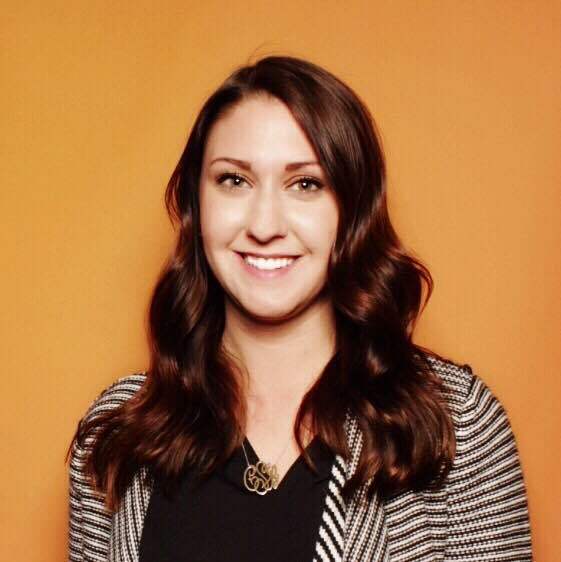 The former is what my colleague Susannah decided to do when she recently launched a holiday campaign around a 2015 ecommerce marketing calendar. In doing so, she created a one-page printable calendar and an installable calendar for Gmail and Outlook detailing all of the important holidays and shipping dates for this season. 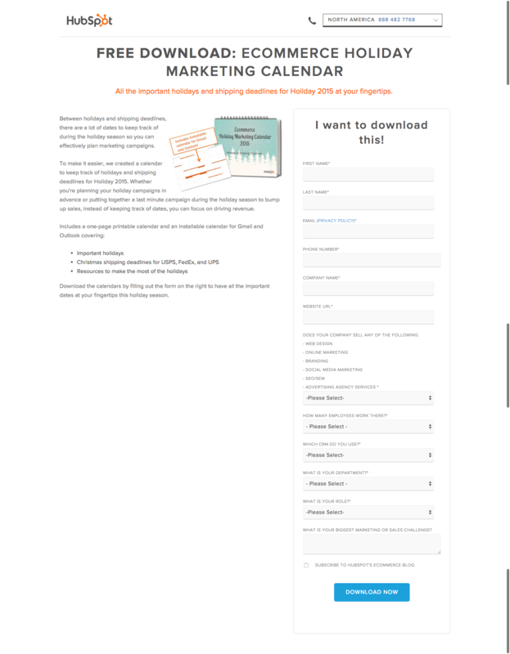 If you decide to take the ebook route, we can help -- you can download our free, customizable ebook templates. We've already taken care of the design element, so all you have to do is focus on writing the content. And if you're in search of some compelling visuals to use throughout your offer, download our 250 free holiday stock photos here. Once your offer is created, you need to provide a place for it to live. This is where the landing page comes in. Compelling headline. This is how you're going to capture the attention of potential visitors. For tips on how to craft the perfect headline, turn to this guide. Interesting visuals. Your landing page shouldn't just be a jumble of text. Think about how you can provide visual context for your offer. The benefits of your offer. This typically takes shape in a bulleted list. The goal here is to drive home what the visitor can expect to get from this offer, and why it matters. A form. This is how you'll collect information in exchange for the offer. Keep in mind that there's no magic number for form fields. In fact, the amount of information you need to ask for on a form will vary from business to business. That said, if you don't really need a piece of information, don't ask for it. If you need some more guidance as to what goes into a great landing page, check out this roundup of 15 brilliant landing page designs. During the holiday season, we'd argue that segmenting your list is more important than ever. Due to the increased number of incoming promotions and the limited amount of time busy shoppers have, well-targeted emails will often take priority over mass messages. Subject line. Focus on what the offer solves. Check out this helpful post for tips on improving your subject lines. Body copy. The body of your email should be short and sweet, much like the copy on your landing page. This is also a great opportunity to incorporate personalization using personalization tokens. Here are some great examples to get you thinking about personalization opportunities. Sharing Options. Don't forget to add buttons to your emails that allow recipients to quickly pass your offer along to their network. HubSpot customers: Thanks to the folks at Brand Builder Solutions, you can get your hands on three awesome, festive email templates for free. Check out HubSpot's Template Marketplace to find the one that fits your needs. Once you've sent an email to get your offer on the radar of your intended audience, it's time to build out your reach even further. Blog posts serve as an effective campaign element for attracting people to your offer, and can be approached in a couple different ways. One way to use your blog to promote your offer is to create a simple "promo post" -- that's what we call them, anyway. This post is typically very short, only offering a quick introduction to the offer, a few value-driven bullet points on what people can expect to learn from it, and a compelling CTA to drive people to the landing page. Promo posts aside, it's also a great idea to add a CTA for your offer to a post that aligns with its subject matter. You can create an entirely new post and revisit older, related posts to swap out their CTAs. This way, if people who reach the end of your post are looking for more information or a deeper dive into the subject, they can click through to the offer. The holidays provide an interesting opportunity for businesses looking to explore platforms they wouldn't typically try. With busy consumers looking for holiday help and inspiration in all corners of the internet and social media, you may find that it's worth promoting your campaign on a wider variety of platforms. Wherever you're sharing your content, you'll need a place to organize and plan your distribution strategy. For that, check out this free social media content calendar. Paid advertising can be a great tool to boost some of your inbound efforts -- especially around the busy holiday season. If your budget allows, you may want to experiment with putting a little money behind some of your campaign assets to promote them on social media. For advice on how to create successful paid advertising campaigns across the three main social media platforms -- Facebook, Twitter, and LinkedIn -- check out this free guide. Interested in Google AdWords? We can walk you through that process, too. Download our beginner's guide to get started. What will happen to your leads once you've generated them? And once the holidays have come and gone, what will they mean to your business? Before you launch your campaign, it's best to design a plan for qualifying and developing your leads once they've filled out your form. With marketing automation software, you can use email nurturing to keep leads engaged with your business and move them closer to a sale. Before you can begin creating emails and workflows, you need to take another look at your list to determine if there are opportunities for segmentation. Dividing your list of leads will make it easier for you to deliver more contextual follow-up emails, which will help you separate yourself from holiday inbox chaos, and ultimately help recipients see the value in your relationship. Next, determine what content you'll use to nurture your leads. You can narrow your focus by honing in on what your goals are for this nurturing process. Do you want them turn these people in sales? Subscribers? Are you looking to direct them to a particular page? And to track your progress, make sure you set a goal for your workflow. If you're a HubSpot customer, you can do so in HubSpot's Workflow App, which makes it easy for you to gauge the performance of your email sequence. Now that you've got everything in place -- offer, landing page, blog promotion, nurturing workflows, etc. -- it's time to take your campaign live. We recommend issuing a "soft launch" before you initiate any promotion, as this will provide you with an opportunity to run through all of the steps yourself to ensure that everything is functioning as it should be. If you can get a few colleagues to fill out the form and run through the stages too, it'll be much easier for you to spot any glitches or missed marks. Once you know everything is sailing smoothly, it's time to kick up promotion and start driving traffic to your landing page. This is the final -- and arguably the most important -- step in the process. Once your campaign has had some time to gain traction, you'll want to dive into its performance and see what you can learn from it. Remember those goals we set all the way back in step one? Now is the time to determine if you actually hit them -- and if you didn't, identify what might have prevented you from doing so. Analyzing where people dropped off in your workflows, blog posts that flopped, or areas of your offer that fell a little flat might reveal what held your campaign back from reaching those numbers. Take note of these details, and use them to inform your next campaign strategy. If you need some help defining what numbers you should actually be concerning yourself with, check out this introductory guide to inbound marketing analytics. This resource will walk you through how to effectively analyze the following: your website and landing pages, search engine optimization, paid search, blogging, social media, email marketing, and lead nurturing and automation. Another helpful resource to make your marketing reporting a little easier is this collection of Excel templates. Rather than having to start a sheet from scratch, these templates come complete with useful functions and formulas for keeping tabs on our goals across many different channels. Are you running a holiday campaign this season? Share your favorite tips in the comments section below.